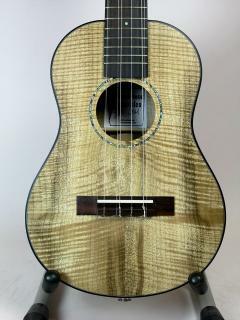 "I had a ukulele emergency, and Gordon and Char were kind and amazing enough to have the perfect ukulele made in their shop and shipped to my hands in ten days - the nick of time for a European tour. I have to say, even if it had taken ten years, I could not have asked for a more beautiful instrument. It has traveled with me all over Europe, and recently into the recording studio, where it blew away the producer and the microphones that recorded it. It's a treasure, and I soon hope it will have a little sister! " 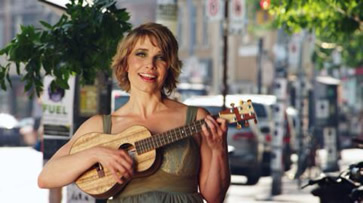 Native of the Canadian northwest, at the border of the Alaska, Shelley travels with her ukulele under her arm. She sings along to her English (and sometimes French) songs, evoking both the northern landscapes of her childhood, and the more intimate landscapes of the heart.